Samurai, spy, commando: who were the real ninja? is an author and historical researcher, founder of the historical Ninjutsu Research team whose aim is to bring Japanese warrior literature to the English speaking world. You can read about the ninja in his works: Book of Ninja, Samurai and Ninja, True Path of the Ninja, In Search of the Ninja, Iga and Koka Ninja and Secret Traditions of the Ninja. He has a bachelors degree in Ancient History and Archaeology and a masters degree in Archology, both from the University of Manchester. For more information see his website or follow Antony Cummins on Youtube. A few people might know a commando, even fewer might know a spy, yet the ninja, or shinobi, of Japan is both a commando and a spy, an instantly recognisable figure from the worlds of combat and espionage who occupies the borderland between reality and the unreal. Despite this semi-mythical status, ninja were real, and an integral part of the samurai war machine from the early Middle Ages through to the 17th century, just as recognisable as any other department of war. Research shows that ninja were used in various roles: as propaganda agents, spy-hunters, commando units, single operators, criminal capture agents, topographers, advance scouts, castle and military camp defence, and of course as classic spies. They were billeted separately from regular troops and excused from daily camp duties due to their nocturnal activities. Japan has a history of using masks to hide identity, and what we think of as the ‘ninja mask’ would have been seen in the streets of most Japanese towns and cities. Such masks would be used by officials not wanting to be recognised, gamblers arriving at gambling dens, and unfaithful husbands in the pleasure quarters of a city. Ninjas, however, were not among the masked. In fact, though hundreds of ninja manuals remain from the Middle Ages onwards, not one reference to masks has emerged. In these manuals, evidence suggests that faces were visible. Instructions tell ninjas to hide the face with the sleeve, and mention the use of white headbands that identify members of a ninja unit at night as well as divine hair pins said to be charged with magical invisibility. The writings also instruct that armour, which has been secured to avoid sound, be used on night raids. Loose clothing is to be worn when infiltrating a housing complex; black clothing for a new moon; light‑coloured clothing for a full moon; and popular colours to be used in open daylight when moving in crowds. The agent is to use disguise when taking on another identity, such as a merchant, monk or beggar. Today’s popular image has the ninja throwing shuriken, colloquially known as ‘throwing stars’ or ‘ninja stars’, items that have almost no connection to the historical figure. Shuriken are a Japanese weapon that did exist throughout the period of the active ninja, but they simply do not appear in the manuals, nor does the equally iconic straight‑bladed sword, crowned with a square guard. Both straight (and, for the sake of argument, almost straight) blades and square hilts existed in Japan but there is no mention of the infamous ninjato or sword of the ninja. 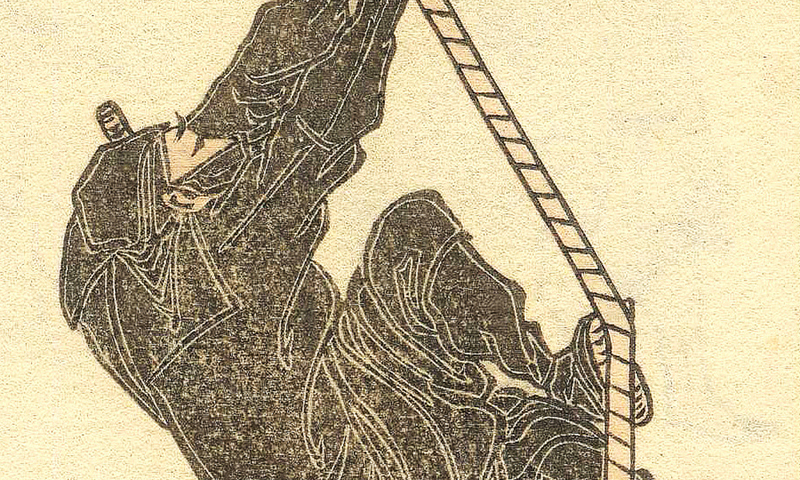 Instead, as part of the samurai class, ninja used the standard weapons of their day along with special infiltration tools, including multiple sizes of saws, keys, nail extractors, drills, iron bars, pincers, shears, lock picks, sound dampeners, silent cloth sandals, low emitting lights, probes, door‑locking devices and sleeping gas. In addition to this, the ninja manufactured and used gunpowder, landmines, hand grenades, waterproof torches, incendiary arrows, scaling equipment, floating aids, collapsible ladders and bridges, signal flares, secret codes and seals. Some of the most fascinating ninja narratives come from The Taiheiki: A Chronicle of Medieval Japan. The 14th-century epic describes the war between Shogun Ashikaga Takauji of Kyoto to the north and Japanese Emperor Go-Daigo, in Yoshino to the south. One night, as it was windy and raining, Moronao took advantage of the weather and sent out an Itsu mono no shinobi ( 逸物ノ忍: excellent ninja) to infiltrate Hatchiman Yama and to set fire to the buildings. The shogunate’s military governor, Tsuzuki-nyudo, led 200 armed people on a night raid, and approached Shijomibu, from the direction where Kukkyo no shinobi (究竟ノ忍: robust ninja) were hiding. Those soldiers [ninja] in the complex did not care for life or death and went to the top of a building, and after spending all their arrows committed suicide (hara kaki yaburu). But it wasn’t until the Edo Period (1603-1868) that mention of the ninja exploded across Japan. The Gunpo Jiyoshu manual, written in 1612 and revised in 1619, is considered a truly accurate account of life inside of a warring‑period samurai army, where shinobi are clearly defined and considered a part of the contemporary war machine. The difficult task of educating the public on the historical truth of the Japanese shinobi still lies before us. The ninja is not a socially unclassified agent who performs deeds the over-romanticised ‘honourable’ samurai will not; instead, he is a bona fide samurai operative trained in propaganda, espionage, counter-espionage and commando tactics, whose place within the Japanese army was clearly understood.